Member of the New English Art Club and The Society of Portrait Sculptors, artist Martin Yeoman trained at the Royal Academy Schools from 1975 to 1979 and teaches today at The Royal Drawing School and the New School of Art. Prolific in portraiture, still life, landscape and sculpture, Yeoman is considered one of the finest draughtsmen today. Working across a broad range of mediums, the artist has developed a style that draws inspiration from Goya and Delacroix. As for the artist painting first and foremost should possess honesty, feeling and integrity, his work is rooted in personal impression, drawing and painting from life. Among his most notable commissions to date is the portrait of singer-songwriter Ed Sheeran and of Her Majesty The Queen’s grandchildren, now housed in the Royal Collection at Windsor Castle. Yeoman has also accompanied HRH The Prince of Wales on official overseas tours to the Gulf States, Hong Kong, Nepal and India. His portrait of Sir James Whyte Black is in the National Portrait Gallery collection. The artist won the Ondaatje Prize for Portraiture in 2002 and the Doreen McIntosh Prize in 2016 and has been included in the Royal Academy Summer Exhibition on 19 occasions (1976–2006), the Lynn Painter-Stainers Prize 2017 and in the BP Portrait Award, 1981, 1983 and 2016. Selected for last year’s BP Portrait Award was Yeoman’s Laurie Weeden, D-Day Glider Pilot portrait, one of four studies the artist made following a special commission by HRH The Duke of Rothesay for the 2015 exhibition The Last of The Tide at the Buckingham Palace. 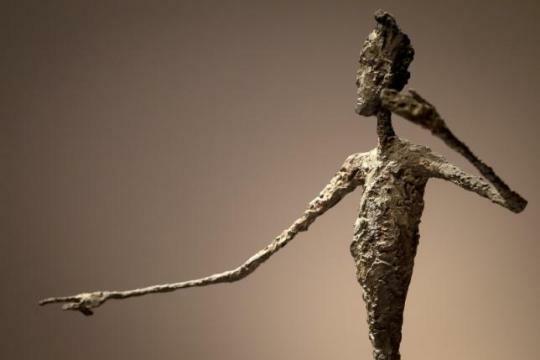 A rich trove of drawings by Alberto Giacometti and photographs of the renowned sculptor and artist has been lying in sealed storage cartons in a Swiss museum for more than two years due to a legal dispute over their rightful ownership. Two more Asian antiquities in the National Gallery of Australia’s collection may have to be returned to India, with news of a new arrest in relation to an Indian art smuggling ring. Another antiquity trader has been arrested who may be involved in the looting of two pieces – an 1800-year-old limestone carving showing a scene from the life of Buddha and a 12th century statue of the Hindu goddess Pratyangira. The report says investigators believe antiquity trader Deena Dayalan sold these two sculptures to disgraced New York art dealer Subhash Kapoor, who is awaiting trial in an Indian prison. Kapoor sold the pieces to the NGA in 2005, which paid $800,000 for the Buddha and nearly $340,000 for the goddess Pratyangira. Following an investigation by the NGA of its Asian art collection, the uncertain provenance of the works had already been flagged in the Crennan Report, released by the gallery in February, which identified at least 22 works under suspicion. Hindus are urging the Art Gallery of NSW (AGNSW) in Sydney to expedite the provenance of its Hindu goddess Durga statue, and if proved stolen, return it to Hindu temple it originally belonged. According to reports, among AGNSW collections, a 140 cm tall early 10th century red sandstone statue of goddess Durga slaying the buffalo demon Mahisha is under scrutiny and it may have been illegally obtained.